The writer acknowledges the financial support of the Whyte Museum and its archives for the research associated with the texts in this blog. Opinions in this blog text are the author’s own. The Whyte Museum in Banff will feature an exhibition entitled Artistry Revealed: Peter Whyte, Catharine Robb Whyte and Their Contemporaries. June 17th to October 21st, 2018. A book, accompanying the exhibition, will be published. The exhibition and publication are supported by the Museum Assistance Program of the Government of Canada. The wedding took place on June 30, 1930, in Concord. [i] The couple drove to Banff in Catharine’s car, a Packard Roadster, arriving in early August, intending to make their home there. At first lodging at Peter’s parents, they spent much of the summer sketching in the mountains, at Yoho, and in early September registered as guests at the Lake O’Hara Lodge. Here they spent a couple of weeks sketching with J.E.H. MacDonald. They then engaged in some arduous hiking. They also began planning the building of their house and studio which would be completed in May of 1931. In early 1931, They had travelled to Toronto and MacDonald introduced them to Lawren Harris. An initial trip in the late autumn of 1931 to Nassau, in the Bahamas, at the invitation of Fred Ambrister, a photographer whom they had met at Lake Louise, proved to be a bit of a disappointment, and the couple were on their way home by January of 1932. [iii] Back in Banff in February, they decided to take on the running of the new Skoki Ski Lodge, receiving guests in the spring of 1932. Re-opening in the spring of 1933, one of their guests, a British mathematician teaching at MIT named Raymond E. Paley, was killed in an avalanche in early April. Peter was devastated by this tragedy and blamed himself. Although an inquiry absolved him of all responsibility, Paley’s death haunted him for the rest of his life. It also ended their ski lodge venture at Skoki. In the fall of 1933, they were in Hawaii for the winter where they sketched. Early in 1934, still in Hawaii, they purchased two steamer tickets for a round-the-world trip which lasted some eighteen months, taking them to China, Japan, the Dutch East Indies, finally returning to Banff, only to leave again on more travels to Switzerland for skiing, then back to Banff, and on to Hawaii again in 1936. A trip down the West Coast, and to Vancouver Island followed, then another through the Panama Canal, on to Europe for skiing in the Alps again. They were soon sketching in Norway in May and June of 1938. With war threatening in Europe, they returned to Banff by September to spend their first full year in Banff. Peter’s father passed away in June of 1940. With the war now enveloping Europe, Peter decided in the summer to join the Reserve Army, and took two weeks of basic training in Calgary. He was 35. Over the next five years, Peter’s efforts and hopes of being named an official war artist met with obstacles and disappointment. Disillusioned, he requested his discharge which he received in December of 1944. [iv] Settled back into his life in Banff, he seems to have turned increasingly to alcohol. In a letter to Catharine in January of 1929, Peter confided in Catharine. “Tomorrow I will be twenty-four. Do you know, Catharine, I have never had a birthday party, not even when I was little? Someday, when I am back from our trip, can’t we have a nice little party, just so I can say I had one? This must sound a bit childish, but there were so many things I couldn’t have when I was small and the others in our family did have, I often dreamed of doing them when I was older, just to even up things.”[vii] The statement has more to do with his sense of being a neglected middle child. It is interesting to note Catharine’s comments on a self-portrait he did in 1932, while she was away from Banff for a few days. Noting that during Banff Indian Days that year he had made three good sketches of the Indian camp and an Indian portrait, she adds: “He also painted a self-portrait and it’s the saddest looking thing I’ve ever seen.”[viii] The rough self-portrait sketch, unfinished, shows his head mostly in shadow, with an unusually large right ear. The face is lacking that quiet smile which one often notices in photographs of him at that time. Over the next decade, after his discharge from the Air Force in 1944, Peter’s mental health continued to be cause for concern. But he nevertheless was able to keep his level of activity up, having decided to submit some of his works to the Art Association of Montreal in 1947, some fifteen years after first submitting to that exhibition. These were exhibited and one of the English language papers singled out “a striking composition of mountains by Peter Whyte.” On his visit to Banff that year, Fred Brigden suggested Peter and Catharine submit works to the Royal Canadian Academy and the Ontario Society of Artists exhibitions in 1948. But another opportunity presented itself when Clare Bice visited Banff in mid-September and was introduced to them by their mutual friends George and Kathleen Daly Pepper. Bice asked to borrow some of their sketches for an exhibition at the London Public Gallery. The offer was accepted and the exhibition was sent off in March of 1948. It was well received and travelled to a number of Ontario galleries, including Hart House. The sketches were also exhibited in Concord. Physically, there was some transformation as well. He was balding and had gained a lot of weight due to being less active than he had been in the 1930s. Their physician, Dr Duncan MacKenzie, suggested that part of the problem might stem from his strict Scottish Presbyterian upbringing, all three boys “having difficulties adjusting themselves now.” All of them were manifesting problems with alcohol. “Dr MacKenzie,” she writes, “thinks Pete has lost a bit of confidence in himself…” He recommended Peter see a Doctor in Vancouver, and the couple decided to take a brief holiday in Victoria, “the first real holiday of this sort we have had since before the war.” Their visit to Dr Davidson in Vancouver resulted in the recommendation that if he could learn to relax, the anxiety and tension might be alleviated. There is no mention of alcoholism in Catharine’s correspondence of the time. But Peter’s addiction was common knowledge in Banff. Close friends were aware of it too, and it seems their good friend Murray Adaskin may have communicated the situation to Lawren Harris, soliciting advice, which was duly given. Clearly, the constant interruptions at home in Banff, the responsibilities and demands on him were not conducive to his peace of mind. Nevertheless, throughout this time, there were sketching trips, and Peter’s work shows no sign of diminishing powers. He was an artist who kept his personal feelings out of his work, other than an obvious affection for his subject matter. A few years later, Peter was diagnosed with cataracts in both eyes and these were successfully operated on in 1953 and in 1957. Peter’s state of mind may have improved somewhat as Catharine no longer mentions it in her letters. Nevertheless, he was visually impaired because of his cataracts for much of the 1950s. Between surgeries, he could only work a few hours a day. I have stressed Peter’s condition over the 1950’s and 1960’s since his productivity decreased during that time. Catharine was much affected by his condition because they always painted together when away from Banff. But in Banff, her obligations as a hostess, and constant interruptions limited her own output. During the 1950s and early 1960s, Peter and Catharine were actively planning their Foundation, and the building of a combined library, archives and gallery building. Peter would not live to see the institution they had planned together and died on 3rd of December 1966. The building was officially opened in 1968. Concluding a brief essay on Peter and Catharine’s work in 1988, their nephew Jon Whyte regretted the fact that neither had left “the legacy of a growing aesthetic vision that seemed so attainable in the early 1930s.”[x] An interesting point, to be sure, and one to which one might hastily agree. But that would perhaps be regretting intentions they did not have. I am not sure either of them would have had such regrets. Perhaps Peter might have. His predisposition to despondency might have suggested failure, but his achievement as a painter was perhaps less a result of his lack of a “growing aesthetic vision” than a chronic lack of self-esteem. He never really recovered from the tragic death of Raymond Paley in 1933. Added to this was a desire to travel in the mistaken belief that self-fulfilment might come in an escape to an unexplored territory. But he could not escape from Banff, to which he always returned. The mountains give him a sense of place, inspired him, but they also closed him in. His academic training and his preferred subject matter may have limited the growth of his aesthetic vision. In that sense, the emulation of established figures such as Rungius and Browne was a handicap, presenting an alternate idea of success. Others, such as Lawren Harris thought him capable of moving on to new avenues of exploration, and a notion of success that he did not share. There is in Jon Whyte’s statement an underlying premise that can also be questioned. What exactly does a “growing aesthetic vision” entail? Who determines or quantifies that growth? What are the criteria? All too often the premise reflects a modernist paradigm where progress and movement determine relevance or significance. The achievements of many other artists have been diminished by the application of an aesthetic that was not in accordance with their own ambitions as expressed in the work they produced. Such is the case with Walter J. Phillips, a friend of the Whytes, who had moved to Banff in the late 1940s, having taught at the Banff Summer School of the Arts since 1940. Douglas Cole questioned Phillips’ marginalization as well. In a lecture on the relationship between Phillips and the mainstream of Canadian art, Cole suggests that his “personality, media, locality and artistic content and style” created boundaries for him. He further posits that his life and character were “not such as lend themselves to mythic treatment,” in comparison, say, to Tom Thomson, Emily Carr, and A.Y. Jackson. That so many fine artists are excluded from the mainstream according to “the forces that make for change” is a matter of fact. When we examine the decades of the 1930s and the 1940s in Canada, we are dealing primarily with the aftermath of the Group of Seven in its expansion as the Canadian Group of Painters, followed by the post-war flowering of abstraction in the 1950s and the 1960s. But Banff being Banff, the East came to the mountains, at least on holiday. If you lived in Banff in the 1940s, you could get to know a number of notable Canadian artists who came to Banff every summer to teach at the developing Banff School of the Arts. A summer sketching camp in 1933 led by British-born Calgary artist A.C. Leighton had been invited to join the University of Alberta Department of Extension’s initiative, creating the Banff School of Fine Arts in 1935. Another British-born artist, H.G. Glyde arrived in Canada to teach drawing at the Provincial Institute of Technology, becoming head of the Art Department the following year. He was also head of the painting division of the Banff School of Arts, a position he would hold until 1966. The Canadian artists invited to teach the summer painting classes in Banff in 1940 were André Biéler, Arthur Lismer and Walter J. Phillips, the latter joining Glyde as a regular instructor. There followed Charles Comfort, George Pepper, A.Y. Jackson, J.W.G. Macdonald, and others. It would seem that the connections of the Whytes with these artists were purely social, although a number would become good friends. Perhaps closest among them, along with Walter J. Phillips who moved to Banff in 1948, were George Pepper and his wife Kathleen Daly Pepper. I started this essay with a personal memory of Banff from the short time I lived there, so it seems appropriate to conclude with another. The Foundation’s building had opened in 1968, just four years before I was hired as the art curator in September of 1972. One of my fondest memories and one that has never left me was the afternoon tea ritual in the afternoon. A tea cart was rolled down a back hallway, and from an open door, tea and cookies were served to guests comfortably seated in a room warmed by a gas fireplace, now called the Swiss Guides Room. Also in that room were some paintings from the modest collection, consisting mostly of works by Peter and Catharine Whyte and the artists they knew and loved. There would inevitably be Peter’s Lake O’Hara of 1935 and his Bow Lake from the Summit of 1945, and one of his works from the Columbia Icefields. One or two of the Stoney portraits done by Peter or Catharine would hang there too, or in the staircase on the way down to the Gallery from the front entrance. Also, in pride of place, near the fireplace, was Aldro T. Hibbard’s Mount Biddle at Lake O’Hara of 1924-25. Often, George Pepper’s large forest landscape was featured as well. The tea and home-made cookies offered to museum visitors were a reflection of the hospitality extended to visitors for so many years by Catharine in her home a stone’s throw away. Another memory for me, of course, was tea and cookies with Catharine at the kitchen table in that memory-filled home. But I was not in Banff long enough to get to know her well. One could, of course, disagree with Catharine about whether or not she was a real artist. Given the paintings she left behind, most people would. We might also disagree with her belief that Peter was the “real” artist. Their place in the context of Canadian art is a difficult one to determine. Who were their peers? They had many friends and acquaintances made over the years, but these were more often social. An interesting document from 1945, annotated by Catharine in 1949, contains short comments about the artists they knew (or with whose work they were most familiar). [xii] But they did not exhibit with them, apart from Peter’s participation in the large Art Association of Montreal’s spring exhibitions of 1932 and 1947. They did not attend these exhibitions and they were not members of any of the eastern Canadian art societies, including the Canadian Group of Painters formed in 1933. This meant that there work remained unknown with the exception of the successful touring exhibition organized by Clare Bice in 1948-49. They did not attend the Kingston Conference held in 1941organized by their friend André Biéler since Peter had by then enlisted in the Armed Forces. Peter and Catharine remained relative outsiders to Canadian art’s system, which Lisa Christiansen so clearly describes in her essay in the book that accompanies the exhibition. They did not really see themselves as part of it, perhaps because of their relative isolation, their special subject matter, and a worldview which always crossed borders naturally and easily. The international destination that was Banff always defined their world and their place in it, as much as their many travels abroad. But Banff for much of the year was an isolated community. That isolation made their works less present and less familiar to the broader Canadian art public. Their physical and spiritual distance from Toronto and Montreal meant that they were out of the mainstream. This is not necessarily to the detriment of an appreciation of their work today. Their work must be considered on its own merits. A comparison of their work to that of their contemporaries, many of them more “modern,” re-enforces their unique contribution, which is above all, a celebration of place. Canadian art history is under constant revision and correction. Strong western voices, past and present, are constantly emerging and are celebrated, and with the emergence of strong western voices, not least of which are the proud voices of Indigenous artists, there is no doubt that more people will come to appreciate the very special and unique contribution Peter and Catharine Whyte made to Canadian art. At the very least, their love of the Rocky Mountains and their generosity of spirit should be celebrated. [i]. Peter’s best man was fellow artist and Boston School student Gardner Cox. Cox had also visited Banff in the summer of 1929 at the same time as Catharine. [ii]. Works exhibited in 1932 were “Lake O’Hara,” and two sketches “Yoho Valley” and “A Lake in the Rockies”. Works exhibited in 1947 were “Stonies” and “Mountain Solitude.” Evelyn de R. McMann. Montreal Museum of Fine Arts formerly Art Association of Montreal Spring Exhibitions 1880-1970. Toronto: University of Toronto Press, 1988., p. 399. [iii]. Catharine’s frank reaction to the whole adventure, on their way home aboard the Empress of Australia, was that “We think it best to call this trip a scouting trip; we have learnt a heap about travelling and have decided that the thing to do is to stick to painting Indians and mountains.” In Whyte, p. 86. [iv]. Caught in the bureaucracy of the Armed forces, when Peter arrived in Ottawa on 30 October he had not been informed of the requirement that he would have had to be in Ottawa the previous 20th of September when the Canadian War Records office had sent the designated “war artists.” For more information on Peter’s service, see Nancy Townshend, A History of Art in Alberta 1905-1970. Calgary: Bayeux Arts Inc., 2005, pp. 63-66. [ix] Lawren P. Harris to Catharine Whyte, 4 April 1949. M36.318. [x]. Whyte, Jon. “Mountain Painters” in Mountain Glory – The Art of Peter and Catharine Whyte Banff: Whyte Museum of the Canadian Rockies, 1988, p. 29. [xi]. Douglas Cole “Out of the Mainstream: Walter J. Phillips and the Context of Canadian Art” in Manitoba History, Number 3, 1982. (http://www.mhs.mb.ca/docs/mb_history/03/phillips_wj.shtml) (28 January 2018). [xii] Author unknown. The development of painting in Canada, 1665-194. Toronto: Ryerson Press, 1945, 65pp. Catharine’s hand-written notes appear in the margins of biography section. 06 D49 Pam. When I lived in Banff (1972-74) locals used to say that if you waited long enough, you would meet someone you knew on Banff Avenue no matter where they lived. Banff was an international destination. Everyone eventually visits Banff. And this proved true, but what was also true is that a lot of people you won’t know come to Banff and you might get to meet them there, and connect. What made Banff the international destination that it was is an interesting story, and it inevitably affects those who live there and those who visit. It is a unique place. For those few actually born in Banff, it provides a different world view because from early on, they have an expansive view of community. The history and development of Banff National Park are linked to the tourism amenities made available from its early history. Added to these, the development of mountaineering and skiing communities would bring even more visitors to Banff. The creation of the Alpine Club of Canada in 1906–in Winnipeg of all places– promoted mountaineering in the ranges in Alberta and British Columbia. Another endeavour, in Banff, was the Banff Winter Carnival, the result of an effort Austrian skier Conrad Kain who built a ski jump down Tunnel Mountain and organized a winter sports festival in 1911, which evolved into the Banff Winter Carnival in 1917. These events attracted young people in Banff, and the ski industry developed as a result. Cliff White, the eldest son of pioneer merchant David White, helped the fledgeling ski industry to develop. His brother Peter was an avid skier from a young age. But he was destined for an artistic career, rather than an athletic one. Born on 22 January 1905, he manifested some interest in drawing. He attended high school in Banff but never graduated. While in his teens, he took a correspondence course in cartooning, and developed his artistic interests on his own, without any encouragement from his parents. Peter had been inspired by the first professional artist who settled in Banff. Nora Drummond-Davies (1862-1949) is known to have settled in Banff as early as 1916. She taught art classes in the local schools where one of her students was Peter White. The year 1916 also brought a very illustrious visiting artist from Boston in the person of John Singer Sargent (1856-1925). He usually travelled to Switzerland for the summers, but given the dangers to commercial shipping wrought by the Germans, Sargent decided to come to Canada instead. The Brewster Company helped Sargent set up his camp in Yoho Park, just across the Continental Divide, first to paint Twin Falls in the Yoho Valley, and later at Lake O’Hara. The result was one of the most extraordinary landscapes of Lake O’Hara ever painted. The first Canadian artist to visit the area was probably Bell-Smith who had visited both lakes O’Hara and McArthur in 1904. In 1921, five years after Sargent’s visit, two American artists coincidentally decided to establish summer studios in Banff. They were Belmore Browne (1880-1954), who purchased a house on Spray Avenue, and Carl Rungius (1869-1979) who purchased a lot on the road to the upper hot springs where he built a house and studio. Both were already well-known artists of landscape and wildlife. Both were hunters familiar with the mountains from previous excursions to American mountain ranges. Rungius had first visited Banff in 1910 at the invitation of outdoorsman and outfitter Jimmy Simpson. Peter Whyte, who was 16 in 1921, soon met these two artists, just when his interest in art was growing. He was often employed by the Brewster Company as a chauffeur for visiting tourists, many of whom were from the eastern United States. Belmore Browne especially encouraged Peter’s interests and provided him with art materials, the younger artist accompanying him on some sketching trips. It was Browne who suggested to Peter that he should attend art school at the recently opened Otis Art Institute in Westlake near Los Angeles. Peter travelled to California in 1923 and attended classes at Otis in 1923-24. Returning to Banff in 1924, he met the New England landscape artist Aldro T. Hibbard (1876-1972) who was visiting and may have painted in his company. Hibbard returned to the area in 1925 on his honeymoon. Hibbard suggested that Peter attend a more established school, the Boston Museum’s School of Fine Art, which he had himself attended from 1909 to1913. Catharine Robb was 19 when she first attended the Boston School of Fine Arts in 1925. She came from a prominent wealthy family living in Concord, Mass., where art and culture were very much part of the environment. Her grandfather was Edward Sylvester Morse, a noted scholar and collector with previous associations with the Peabody Museum of Salem and the Boston Museum of Fine Arts. Her father, a prominent engineer with Stone & Webster, a pioneering firm of electrical engineers, prospered with the company. Before her society debut in December of 1924, she had attended a private school since 1921, the Wheeler School, in Providence, RI, a school focused on the arts and liberal arts, where she graduated in 1924. She excelled in art and art history. The family commissioned her portrait by Frederick Bosley (1881-1942), a Concord resident, who taught painting at the Boston Museum School. The summer of 1924 was spent travelling abroad, on a grand tour of Europe. Departing from Boston on 9 June 1924, Catharine and her family arrived in Liverpool nine days later. Visits to the National and Tate galleries in London are mentioned in her journal, as well as the British Museum. Cathedral visits are also mentioned, including Gloucester, Wells, Salisbury and Winchester. In Holland and Belgium by mid-July, she visited The Hague, Haarlem, Amsterdam, Brussels, Brugge and Ghent where she mentions seeing the great Van Eyck altarpiece, The Adoration of the Lamb. In Paris, the family attended performances of Faust at the Opera and Carmen at the Opéra Comique. They visited the Louvre, Versailles, and Fontainebleau as well as the village of Barbizon where Millet’s studio was located. Back in Paris, there were visits to the Eiffel Tower, the Bois de Boulogne and Montmartre, as well as a dinner at La Tour d’Argent. A motor trip to the Loire Valley afforded some visits to famous châteaux such as Chenonceaux, Amboise, Azay-le-Rideau, Chinon and Ussé. From Tours, they travelled to Nantes and into Brittany, visiting Pont-Aven, Concarneau and Quimper, then on to Mont St-Michel before returning to Paris and visiting the Luxembourg galleries where Catharine noted in her journal there were “some awfully good modern pictures we enjoyed.” In 1925, the Musée du Luxembourg housed collections of Realist, Barbizon and Impressionist paintings as a result of various gifts and acquisitions at the turn of the 20th century. They then travelled to Switzerland by way of Dijon, stopping at Geneva, Lausanne and Lucerne before crossing the border into Italy, visiting Como and Verona. In Venice, they stayed at the famous Hotel Daniele, taking in a performance of Puccini’s La Bohème at the Fenice Opera house. The trip continued with a stay in Florence and in Perugia before moving on to Rome where all the major landmarks were visited, as well as the Villa Borghese and the Vatican Museums. They finally reached Naples, by way of the Campania, and after a visit to Pompeii, they boarded a ship at Naples on 2 October, arriving in New York on 11 October. At the very beginning of her tour in London, she wrote in her journal (30 June): “I was so glad to see such famous pictures I studied about in school,” and that statement could be applied to the entire tour, when one remembers that the study of art history at places such as Wheeler at the time would be through black and white lantern slides, illustrations in black and white or chromolithographs. Of course, the Boston Museum of Fine Arts was not too distant and offered a very fine collection. Catharine notes in a later interview, “My mother wanted me to be an artist more than I did” adding that her mother had gone to the same school in Boston. Nevertheless, few first-year students arriving at the School of the Boston Museum of Fine Arts in the fall of 1925 could have boasted of recent visits to some of the great museums of Europe. The Boston aesthetic was avant-garde when compared to the Hudson River School aesthetic that prevailed in New York in the 1870s and 1880s. This would change substantially in the first two decades of the 20th century, when Boston ceded its leadership position in modern art to New York, as a result of its reaction to the International Exhibition of Modern Art held in New York in February 1913, when about 1,250 works of art, by 300 American and European artists, were shown at the 69th regiment Armory on Lexington Avenue. Organized by the Association of American Painters and Sculptors, the majority of works were by contemporary American artists, but the exhibition included an overview of the more modern tendencies in art by French artists, from Impressionists such as Monet, Postimpressionists such as Cézanne, Gauguin and Van Gogh, works by Fauve artists Henri Matisse, Cubist artists such as Francis Picabia and Marcel Duchamp, Pablo Picasso and Georges Braque. It also included work by Symbolists such as Puvis de Chavannes and Odilon Redon. Among the American artists featured in the Armory Show were those associated with New York’s Ashcan school. That the response in Boston was so tepid was due to its relative indifference to avant-garde European developments. Boston’s artists were not affected by the Armory Show, compared to those in New York and Chicago. Was this complacency? It seems to have provided an opportunity for them to reaffirm their adherence to the solid values based on French academic standards, touched with the freshness that Impressionism had brought to painting in the latter part of the 19th century, as well as its celebration of upper middle-class elegance and sophistication. A little more than a year after the Armory Show, World War I began to ravage Europe putting an end, for the time being, to the frantic experimentation that had characterized French and German art in cities such as Paris, Munich, Vienna and Prague. By 1918, artists and intellectuals began to express a nostalgia for more stable times perhaps best expressed by the expression “a return to order” or a “call to order.” For Boston, this meant a kind of reaffirmation of the values it had upheld since the late 1880s. By the time Peter White and Catharine Robb arrived for their first semester at the end of September 1925, the School retained its reputation. Its adherence to traditional values was reflected in its academic teachings which would go unchallenged until the late 1930s. In contrast to New York, where an interest in modern art developed, Boston preferred painterly scenes of elegance and gentility. The semester started on 28 September 1925. Peter White’s most significant art experiences would have been the works of Carl Rungius and Belmore Browne. With money earned between 1924 and 1925 (as his parents were not about to support him in this endeavour), he registered at the Boston School. All of the instructors at the School in 1925 were established academic artists, most of them having studied in Paris. The youngest was Leslie P. Thompson (1880-1963) who was 37 years old. He had already been teaching at the school for twelve years and was a follower of Edmund C. Tarbell (1862-1938), one of the pillars of the Boston School. He was one of Peter and Catharine’s first teachers, the instruction of that year consisting of drawing from plaster casts in charcoal. Catharine’s first mention of Peter occurs on 11 November 1925 where she mentions his skiing abilities. “Peter White, a Canadian, is one of the best of skiiers and was in the Canadian circuit last year, which goes all around trying the various jumps. He’s been over all the highest.”  They both did quite well during their first year, Catharine even winning the year-end Concours for a figure study. Portraiture would remain her preferred genre, as she would later admit. During that academic year, they would get to know each other, Catharine described him in her journal (March 17, 1926) as “a perfect, blue-eyed innocent boy, kind and good and ought to paint well one day.” At times they visited Boston exhibitions together. There was an exhibition of Belmore Browne’s Rocky Mountain pictures at the Casson Gallery, one of which she bought. Another exhibition was that of Aldro T. Hibbard who was exhibiting at the Boston Artists’ Guild Gallery. Catharine wrote of Hibbard’s pictures as “wonderful” with “so much strength and color.” Peter was able to introduce Catharine to Mr and Mrs Hibbard. There is no record that either did much work during the summer of 1926. Peter had the opportunity to sketch with Belmore Browne, if he had spare time from working for Brewster’s, chauffeuring hotel guests or accompanying them on excursions to the Lake Louise area and the Yoho Valley. This was the first summer that the new Lake O’Hara lodge was open for business. Guests that year including the etcher Herbert Raine from Montreal, Lawren Harris and his family in mid-July and later J.E.H. MacDonald from Toronto, the latter’s third summer trip to the Rockies. In mid-to-late August, three artists from Winnipeg were camped on Lake O’Hara, at some distance from the lodge. They were Walter J. Phillips, Thomas Wesley McLean and Eric Bergman. The Rocky Mountains were a popular destination for artists during the 1920s. Over the next three years, undergoing an academic training, both Peter and Catharine would begin to mature as artists. In one sense, Peter matured more quickly due to his returning to Banff every summer, often leaving before the end of term when opportunities for employment came his way. A number of times, he accompanied Chinese workers travelling through Canada under bond ensuring their return to China after working in Caribbean countries. Despite his early spring departures, the School awarded him scholarships so he could return. The relationship between Peter and Catharine developed, especially after the death of Catharine’s father in February of 1927. It seems that as a result, she found Peter’s company comfortable. He was unpretentious, honest, genuine and easy to talk too, a refreshing change from the Boston social circles with which she was familiar. They encouraged and believed in each other. There is no evidence that Catharine painted much landscape until she visited Banff during the summer of 1929. Catharine’s trip to the mountains was of critical importance for her. She not only loved the mountains but was also given some idea as to what life in the mountains would be like. She took to it easily. Peter did not attend the Boston School for the 1929-30 term. In the fall, he was at Lake O’Hara sketching first with J.E.H. MacDonald, and also Richard Jack (1866-1952). Jack was a British-born artist, originally one of Canada’s War Artists at the end of the First World War. He had immigrated to Canada in 1927, settling in Montreal. Peter’s two sketching companions could not have been more different in their approach to the landscape. Jim Brewster had suggested he work in the company’s Honolulu office for awhile, and Peter found a way to sail to Honolulu by way of China and Japan. From Honolulu he then took a boat back to the Orient, then on to Indonesia, through the Red Sea and to Europe, thus going around the world before joining Catharine again in London, where the couple planned to marry. By the time the wedding date approached, Catharine had thought it better to go through with a social wedding in Concord, as would have been expected of her, and to which Peter agreed. They reunited in Edinburgh and sailed back to New York, arriving on 1st of June.
. Catharine’s travel diaries are preserved, along with much of her extensive correspondence at the Whyte Museum of the Canadian Rockies, providing the primary source for biographical details in this text. The Musée du Luxembourg collections would not be transferred to the Louvre until 1928.Later, these collections were housed at the Musée du Jeu de Paume after 1947. Most of these collections were subsequently transferred to the Musée du Quai d’Orsay after its creation in 1977 where they remain to this day. https://fr.wikipedia.org/wiki/Mus%C3%A9e_du_Luxembourg and http://www.musee-orsay.fr/fr/collections/histoire-des-collections/peinture.html (7 February 2018). Joan Murray, “Catharine Robb Whyte 1906-1979” in Canadian Collector, May-June 1979, p. 25-26.
. Jon Whyte. Pete ‘n’ Catharine, their Story, Banff: The Whyte Foundation, 1980, p. 26. Joan Murray, op. cit. p. 27. This 1926 exhibition in Boston, included 13 paintings done in the Banff and Lake O’Hara area. Giovanna Garzoni, Cherries in a Dish, a Pod, and a Bumblebee, ca. 1642-51. gouache on parchment, 24.5 x 37.5 cm, Galleria Paletina, Florence. The cherries on the trees were just beginning to turn pink, when I first thought it was time to turn to this blog again. Seemed like a productive thing to do while I recovered from knee surgery at home. In an earlier blog this year [18 January 2015] I mentioned the marvellous late Renaissance Italian painter, Giovanna Garzoni, who specialized in still life paintings and miniatures. She is almost unknown even though she has been the subject of a couple of exhibitions and one modest book. Still life painters rarely get included in the canon of great artists, let alone female artists who worked with still life. All the more reason to celebrate them here! I begin with Giovanna Garzoni because she was one of the earliest. In her case, still life painting comes out of natural history illustration, such as botanical art and scientific illustration. This was, after all, the late Renaissance where the study of the natural world through direct observation was an intellectual pursuit. This was also an age of inquiry where some effort was made to represent the natural world as realistically as possible. The aristocracy of the day who were the artist’s patrons had a considerable interest in the natural world, as they designed and constructed their gardens, importing plants from far off places and exotic lands. Apparently her first commissioned work (from a pharmacist) was a Herbarium when she was 16 years of age. A fairly early marriage ended in an annulment as it seems Giovanna had already made a vow of chastity. As she had no man to support her and she did not join a religious order, she was totally dependent on aristocratic patronage, and this she seems to have been able to secure throughout her life. The appeal of her work on parchment using opaque watercolours (gouache) and the intimate nature of her small scale works found support, and these works even in reproduction provide an indication of her achievement. 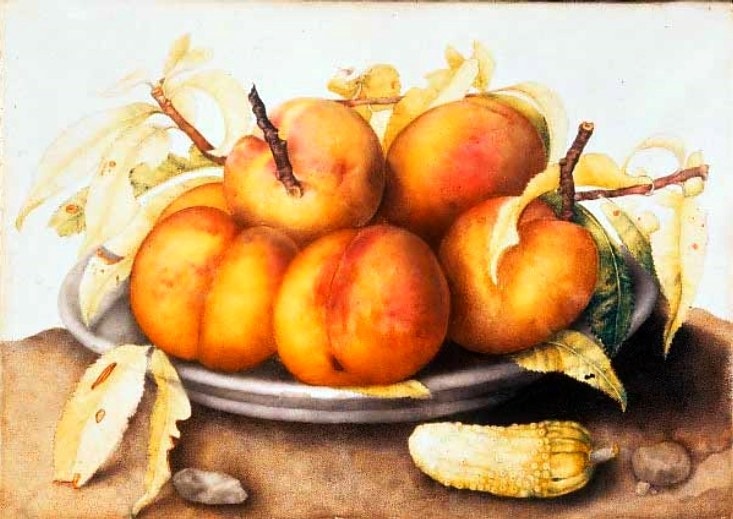 Giovanna Garzoni, Peaches in a Dish with Cucumber, n.d. gouache on parchment, 25 x 36 cm, Galleria Paletina, Florence. The colour of the peaches is most lovingly rendered. The cucumber looks a bit strange, but may be a variety foreign to North American markets. The leaves show signs of insect damage. 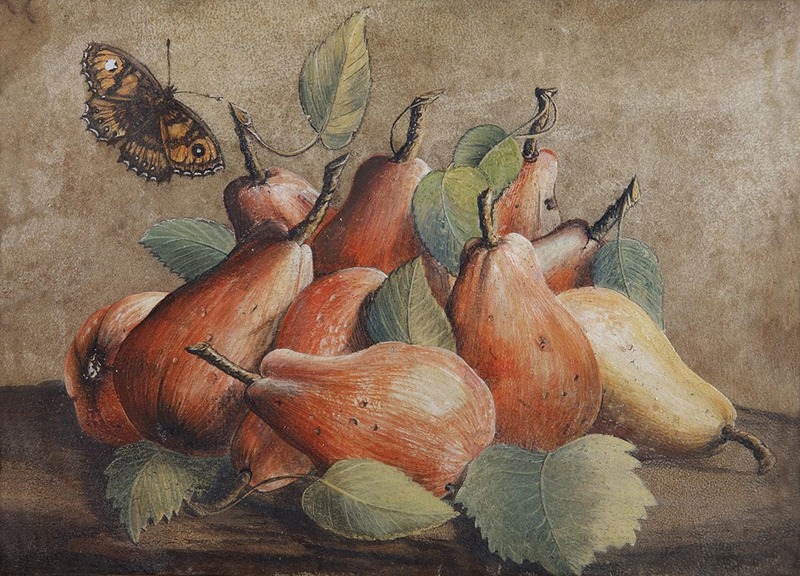 Giovanna Garzoni, Still Life with Pears and a Butterfly, n.d. gouache on parchment, 17 x 23.5 cm, Dorotheum, Vienna. Apparently an earlier work by the artist, the pears seem a bit artificial, while the butterfly is possibly pinned to the wall rather than in flight. One characteristic of a Garzoni still life is the tight grouping of the fruit on a table or in a bowl, along with the leaves of the tree fruit. The inclusion of the leaves may be a characteristic of botanical illustration. 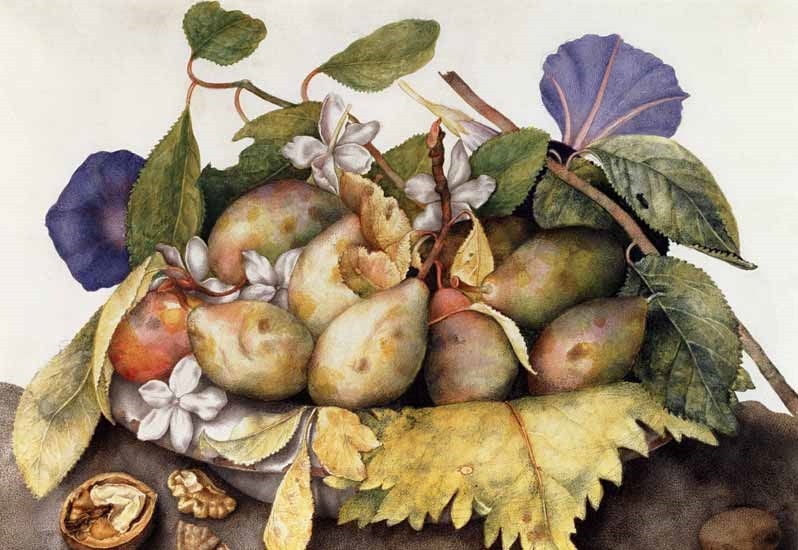 Giovanna Garzoni, A Plate of Figs, 1652. gouache on parchment, 26 x 38 cm, Galleria Paletina, Florence. 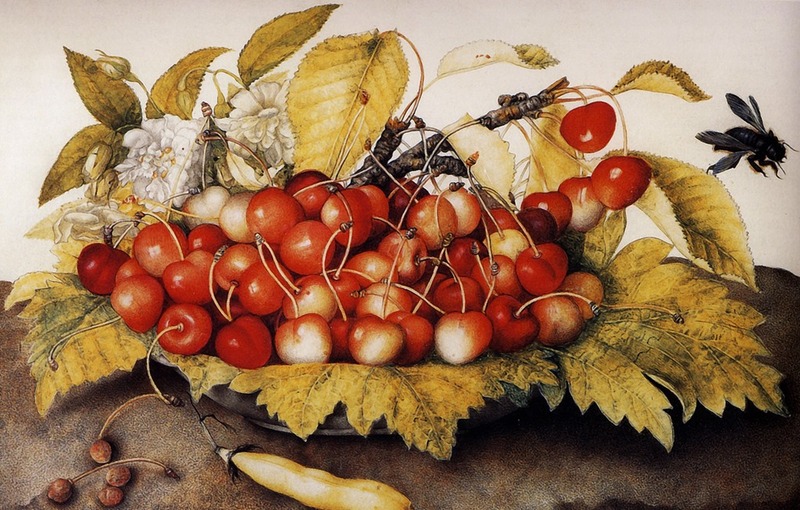 Giovanna Garzoni, Figs in a Chinese Bowl, with Cherries and a Goldfinch, n.d. gouache on parchment, 26 x 38 cm, Galleria Paletina, Florence. 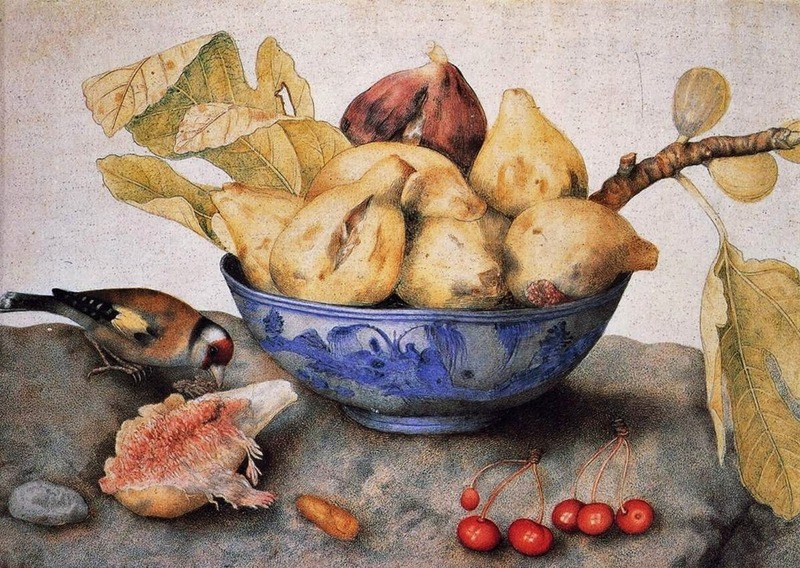 A number of works feature figs, and others contain birds pecking at the fruit. The figs are in an imported blue and white Chinese bowl, no doubt owned by her aristocratic patrons. The figs are literally bursting in their ripeness. 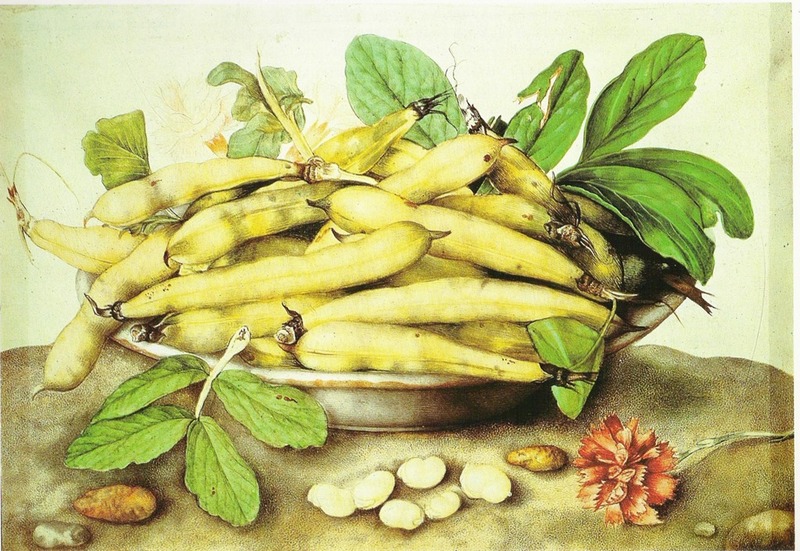 Giovanna Garzoni, Beans in a Dish, n.d. gouache on parchment, 24.5 x 34.5 cm, Galleria Paletina, Florence. Almost bursting out of their pods, these beans are shown in a simple earthenware dish, with a worn rim, along with some beans, leaves, and some carnations. 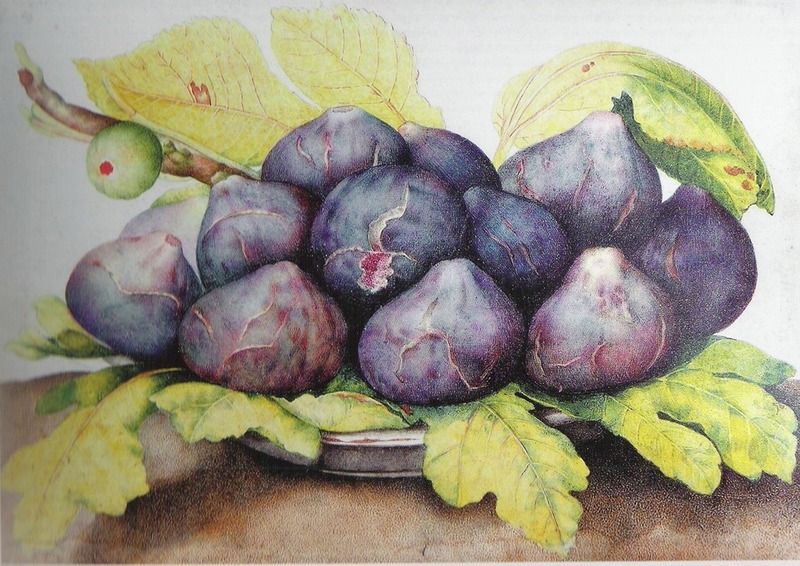 Giovanna Garzoni, Plums in a Dish with Jasmine and Walnuts, n.d. gouache on parchment, 23.5 x 38.5 cm, Galleria Paletina, Florence. Apparently plums, although they look like some type of small pear to me. White jasmine flowers are also included. The bluish flowers seem to be some type of Morning Glory. A cracked walnut is also offered. Giovanna Garzoni, Melon on a Plate with Grapes and a Snail, ca. 1642-51, gouache on parchment, 35.5 x 49.5 cm x 38 cm, Galleria Paletina, Florence. 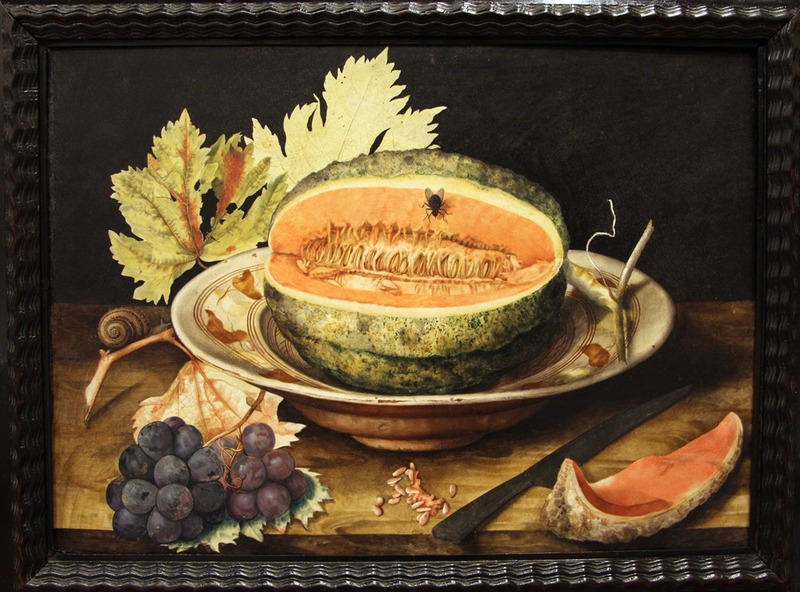 A melon is presented on an old earthenware plate, along with a knife that has been used to cut a wedge from it. Melon seeds also appear, as well as grapes. A very realistic fly on the melon demonstrates the painter’s skill at verisimilitude. A snail appears on a a stem as well. In many ways, such still life painting may evoke the story of the ancient Greek painter Zeuxis whose painting of grapes was so realistic that birds flew down to peck at them. Giovanna Garzoni lived and worked in a time when still life painting was just coming to the fore, although it was always considered a minor branch of painting. The 17th century also produced brilliant still life painters in the Netherlands, and many are far better known that Garzoni. But there is a quiet charm to her small-scale work which is often not present in the work of her Dutch contemporaries who seem to revel in displays of virtuosity. I have always loved still life painting and sought it out in galleries and museums I have visited through the years. I will return to the subject of still-life painting in further posts. Trkulja, Silvia M. & Fumagalli, Elena. Still Lifes – Giovanna Garzoni. Paris: Bibliothèque de l’Image, 2000. A slide show of Giovanna Garzoni’s work can be seen on YouTube, unfortunately without details. Some of the pictures also lack clarity, but it is still worth viewing. I suppose my choice of Joseph Vernet as the subject of no less than three posts on this blog might be seen as questionable. It is not my intention to attract hundreds of readers by writing about the Impressionists or Vincent Van Gogh, but to present and discuss artists whose work is significant and provides a context to the work of better known artists. I have never believed in a “greatest hits” approach to my personal research or curatorial endeavours, and have always found great satisfaction in discovering artists lesser known today, but whose work is nonetheless worthy of attention and study. Vernet fits the bill admirably. He was, by all accounts, a modest man, but witty and well-educated; he functioned well in a society where notable people held “salons” for intelligent discussion on a wide range of subjects such as philosophy and literature. An evening’s entertainment might also include musical and dramatic performances. There is even some evidence that during his stay in Italy, Vernet befriended the young Giovanni Battista Pergolesi (1710-1736) and that Pergolesi performed the opening of his famous Stabat Mater on Vernet’s harpsichord in 1736. The autographed manuscript of its opening bars was one of Vernet’s treasured possessions until the day of his own death in 1789. This was the Age of Enlightenment in France, and we have to imagine Vernet in this social context, as well as in the more solitary activity of the artist sketching in nature, and working on his large canvases of the ports of France in the studio. He began work on the French ports of the Atlantic in 1757, as part of a larger royal commission to paint all the ports of France. 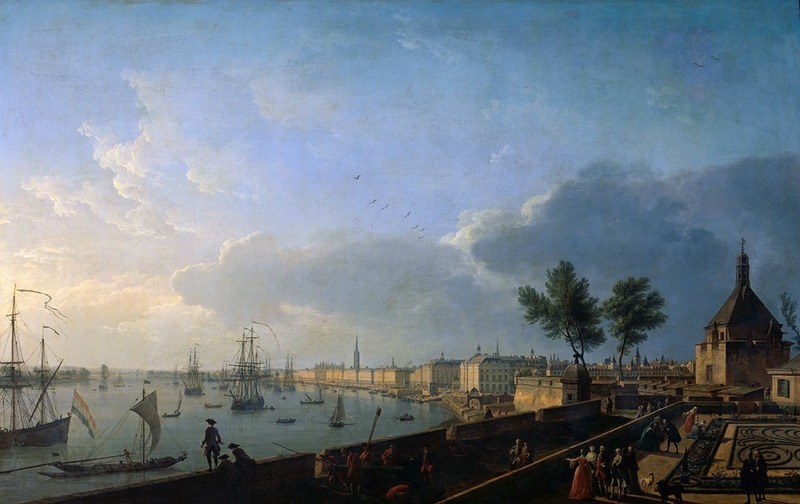 Vernet arrived in Bordeaux in May of 1757, and he and his family were to stay there for two years. They were well received by Bordeaux society, and Vernet also received small commissions which contributed to the well-being of his family. By then, the Seven Years War (1756-1763) was in progress, and to us in Canada the War had serious repercussions, as France lost her North American colonies to Great Britain in a series of decisive battles: Louisbourg (1758), Québec (1759) and Montréal (1760). It is during this critical period that Vernet was painting his series on the ports of France. This was no doubt part of the reason he had to obtain all kinds of authorizations to sketch the ports, a source of delays and frustrations. The Seven Years War which ended with the Treaty of Paris in 1763. By then, King Louis XV had apparently uttered that there were more French ships in Vernet’s paintings than in its Navy. 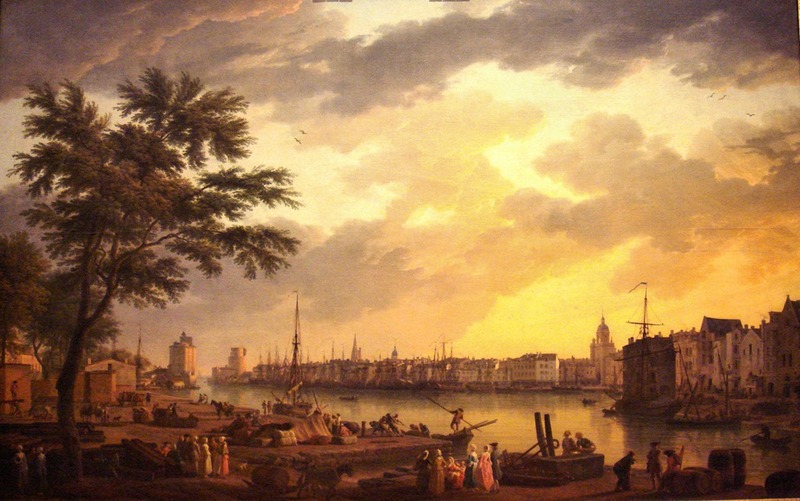 Vernet decided that two views of Bordeaux would best represent the activities of this important port. He suggested that both views would be from the Chateau Trompette, the first featuring the chateau itself, along with a grand view of the city and the port. The other view was on the other side, towards the port for foreign vessels. He was amiably received by the Marquis de Tourny who was in charge of the many changes taking place in the port at the time. While it was decided that the buildings would be painted as could then be seen, by the time the the paintings were finished, Vernet had more or less represented the buildings as if completed, with more vessels in port, and the setting would be in peace time. The official instructions had mentioned that the export of French wines was an important activity in this port. Both paintings were ready to be sent by special courier to the Marquis de Marigny in Paris by July 1759, who was delighted with the results. They were shown in the Salon of 1759, and attracted favourable comments, including from Denis Diderot who found in the works of Vernet imagination, fire, wisdom, colour, detailing and variety. Apparently there were no less than 14 or 15 works by Vernet at the Salon that year. 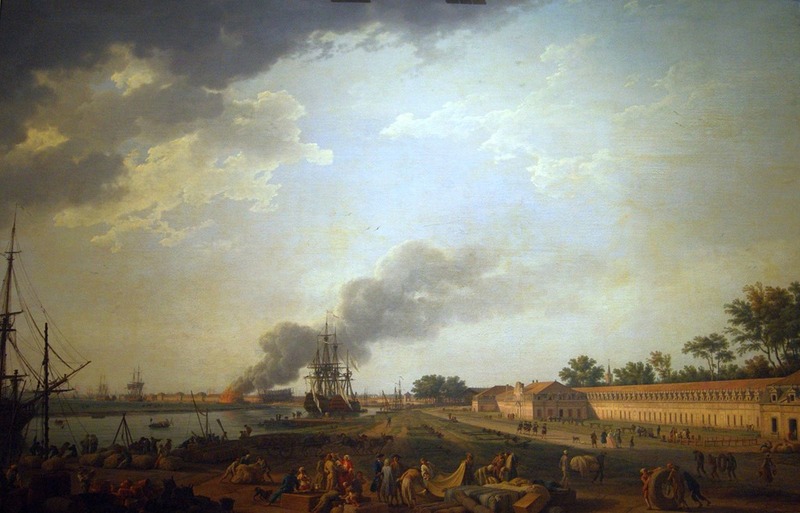 Vernet at first intended to leave his family in Bordeaux while painting his intended view of Bayonne, where he arrived in July of 1759, but he was delighted with the city and since the cost of living was cheaper, he decided to bring his wife and two sons to Bayonne. 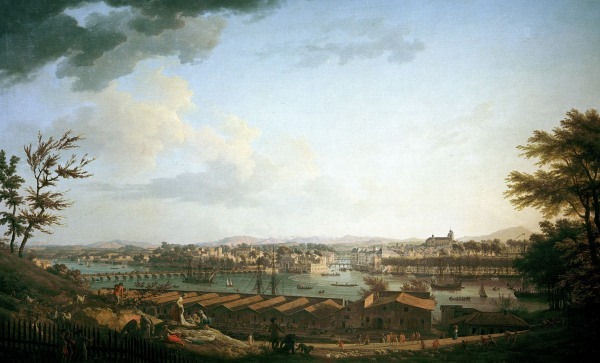 He also decided on two separate views of Bayonne, because once again, a single painting would present a very incomplete view of the port, and Marigny agreed to two paintings. Delays in payment apparently contributed to the delays in completing these works since Vernet once again had no choice but to accept other commissions to make ends meet. The works were sent to Paris in June of 1761 and were exhibited at the Salon. Diderot, in his critique, regretted that the time of day chosen for these works, sunset, obscured much of the activity and the figures painted in the foreground. While the official instructions had suggested the motif of privateers returning to port with their prizes (as they had been very successful at this during the Seven Years War), Vernet chose to represent local activities and entertainments. Rather than depicting a storm as suggested, Vernet chose the calm of sunset. By July 7, 1761, Vernet had moved on to La Rochelle. Because of swamps near Rochefort (not too distant from La Rochelle in any case) Vernet was concerned about epidemics and intended on working in Rochefort only during the ‘healthy’ season. He would stay in Rochefort twice—in November of 1761 and in February of 1762. While all the studies for the paintings of La Rochelle and Rochefort were done over the period of less than a year, at long last a studio vacancy in the Louvre occurred and Vernet was authorized and encouraged to move to Paris where he could complete the views from his studies and sketches. This he did in July and the paintings were finished by the time Vernet turned to the painting of Dieppe. 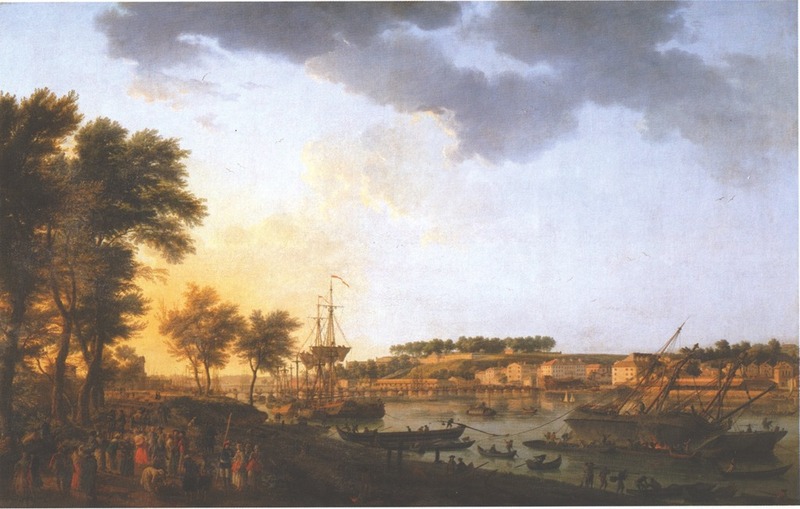 The views of Rochefort (in the morning) and La Rochelle (at sunset) were extremely well received both at court and upon their exhibition at the Salon of 1763. Vernet finally settled in Paris in 1762. 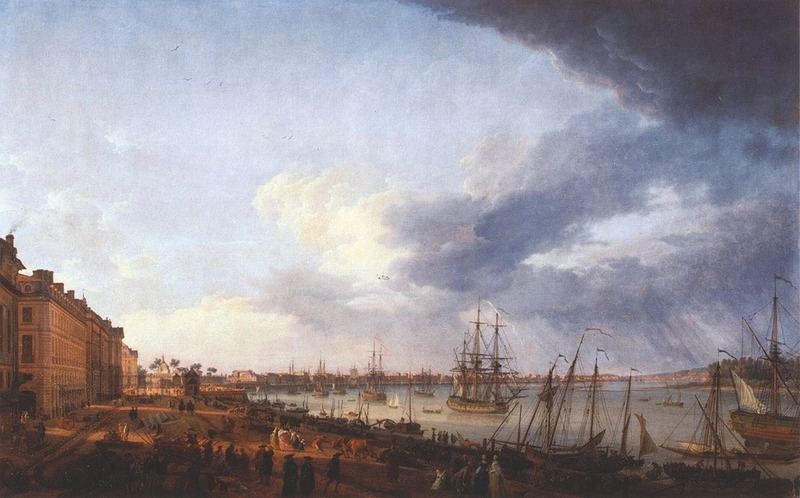 The original commission had included many of the ports of the Atlantic, but after Bordeaux, Bayonne, La Rochelle, Rochefort, had been painted, Vernet received permission to do a painting of Dieppe, which was not on the original list. He stayed in Dieppe for six weeks and was back in Paris before the end of October. He was delighted with Dieppe, a fishing port, and he worked on the painting in Paris, completing it in 1765, in time for the Salon of that year. By then, the commission was discontinued for lack of funds. The ports of Brittany and of Normandy would not be painted by Vernet. Le Havre was only beginning to develop as a port of any significance, but had been on the list as were Calais, Dunkerque, Port Saint-Louis, Brest, Lorient and Saint-Malo. Thirty years later, after Vernet’s death, the Revolutionary government commissioned the artist Jean-François Hue (1751-1823) in 1791 to complete the series, and so he painted three views of Brest, and views of Lorient, St-Malo, Granville and Boulogne. By all appearances, he lacked Vernet’s abilities, certainly as far as the treatment of water and the painting of figures. While Hue had also been appointed as the French state’s official marine painter, there would be no marine painters in France achieving the fame and stature of Joseph Vernet. He ended his days in Paris. He was never short of commissions, and although his work was in decline, his reputation had long been international, and the popularity of his work was only increased by its reproduction through the medium of engraving. He was not forgotten, and some notable biographies of his life were published during the 19th century, as well as appreciative commentaries on his work. No history of marine painting can omit the name of Joseph Vernet. — “Works of the Great Masters. Joseph Vernet.” in The Illustrated Magazine of Art, Vol. 1. No. 4, 1853, pp. 192-202. Delaborde, Henri. Le paysage et les paysagistes en France depuis le XVIIIe siècle: Joseph Vernet. 1852. (Kindle edition – STAReBOOKS edition, 2013. Demarcq, Marie Pierre. 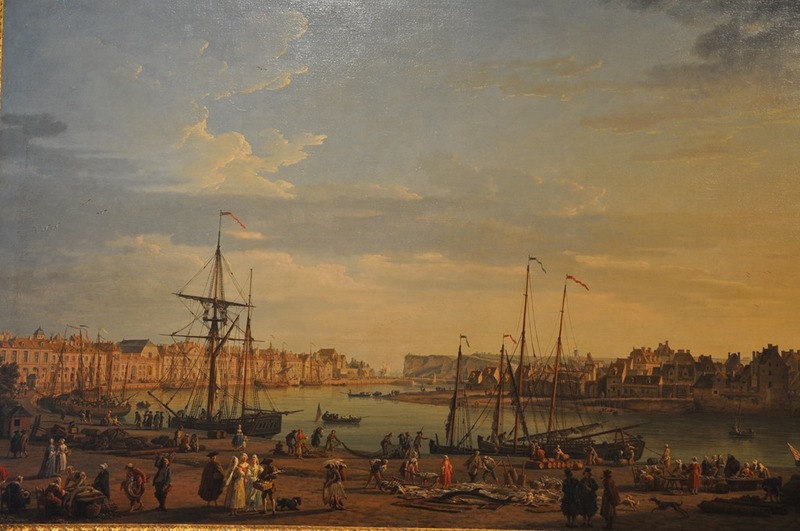 Joseph Vernet (1714-1789) : Les vues des ports de France. Paris: Musée national de la Marine, 2003. Lagrange, Léon. Joseph Vernet et la peinture au XVIIIe siècle. – Paris : Didier. – 1864. Miger, Pierre-Auguste. Les Ports de France peints par Joseph Vernet et Jean-François Hue, Paris, Lenormand, 1812, 126 p.
A bibliography can be found on the website of the Musée national de la Marrine.